I kept joking with my hubby this after making this blouse that "drag lines are a drag", hence the title. This is a flop sewing project for me. It was partly self drafted, which could be the problem. Everyone has their bad days. The drag lines aren't horrible, but after sewing for awhile, it's easy to spot mistakes and they can bother you. I am trying to look seriously mad here at my project. There were a few moments at the machine where I wanted to throw something, but in the end, had to smile at myself. This is the amazing part of the story, I still love this blouse. Been wearing it every week since starting my self challenge, yep still hanging in there, wearing my handmade clothing everyday. It's been good to wear the things I have made even if they are wonderful, okay or imperfect. It's all good. I wore this blouse yesterday and got a ton of comments, while maybe 5 to be exact, three from perfect strangers. My big solution for the drag lines, a little pink cardigan! I think now I can spot my mistake. Can you see it? It's the shoulder line, where is it? It's too far back. I found this video on YouTube by Gertie. It has me thinking a lot about shoulder seam lines. I may try this blouse again. I love the pink, been in a pink mood lately. Have a wonderful vintage day! Be back soon with a another sewing project, hopefully no drag lines! 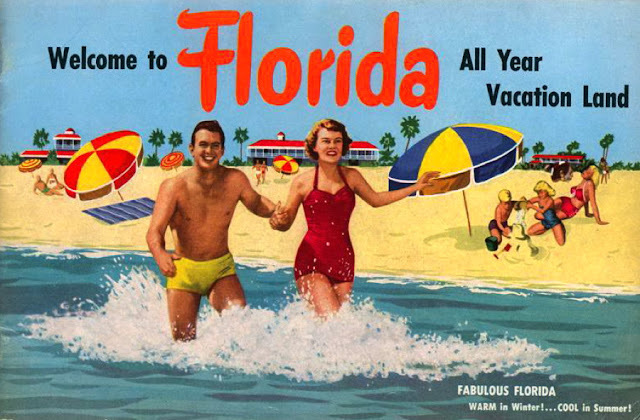 Last Friday my husband called at 3:00 in the afternoon saying "Darling, would you like to go to Florida for vacation? Can you be packed in a couple of hours?" "Sure sweets, no problem," I replied as I hung up the phone and panicked. Thank God I have a handy travel list ready to be printed up for such emergencies. After an 18 hour drive with two active boys we made it to Florida and have been enjoying a much needed spring vacation. So far, we have made it to Legoland, went on an airboat ride to see the alegrators and I took a trip to The Sewing Studio to buy fabric. It was a great week in the sun. We are back now and I am doing my best to catch up on things. I have to be honest because of this unexpected trip I feel a bit derailed from my challenge to wear and sew all my spring clothing. I have been wearing something I've made everyday, but I have been away from my sewing machine too long. Since coming home, I am more excited now about making and wearing my handmade clothing. I haven't been able to get many photos for this self challenge yet, but was able to get a photo one day as the boys and I went antique shopping. I made both the skirt and blouse last year and finished the outfit off with a thrifted sweater. I recently got a haircut, I asked for a vintage long middy cut, I don't think she understood because it looks pretty much like a modern hair do. Last but not least, I signed up for Zoe's Me-Made May 2012. I love the idea of joining others in this adventure. Last year I joined in and thought I would sew as I go, but found it hard because I didn't have much clothing to wear and couldn't keep up with laundry. I am better prepared this year and am embracing the challenge fully. Hooray! 'I, Regina from Vintagegirl, sign up as a participant of Me-Made-May '12. I endeavor to wear at least one handmade/refashioned garments each day for the duration of May 2012'. Okay that's done! I hope to be back with a new outfit soon! Happy Spring!